Also see: Chicken Biryani, Vegetable Biryani, A Quick Biryani, Soya Chunk Biryani, Chicken Fried Rice from Leftovers, BBQ Selection and Marinade Selection. 1 kg. lamb or mutton leg/shoulder cut into small pieces Meat on bone is good for this dish), washed and drained. Do not use poor quality meat for this dish. A few strands of saffron soaked in a tablespoon of warm water or a little yellow colour in water. If dry colour powder is used, dissolve it in a teaspoon of water. Peel, wash slice onions thinly. Peel, wash and grate ginger and garlic finely. Measure all whole spices*. Crack brown and green cardamoms a little with a rolling pin/pestle. Keep all whole spices aside together. Measure/prepare all other ingredients as listed and spread out on a plate or chopping board, so they are easily accessible..
Frying Onions : Heat the oil/ghee in a large pan and fry onions, until quite dark brown. Take out & keep aside. I put them in a wire sieve, to drain off excess oil, collecting the oil in a bowl. Cooking the meat: In the same oil, if there is too little left, add another tablespoon or two of oil, add all the whole spices; cloves, cardamoms, cinnamon, black peppers, cumin, bay leaves and then ginger and garlic. Fry for a couple of minutes. You will get a distinct aroma of fried garlic and spices. Fry for 20-30 seconds, till aroma rises. Add meat pieces, salt and chilli powder. Stir fry on moderate heat, until meat is nicely browned on all sides. Add yoghurt, tomatoes, 2/3rd of coriander and mint leaves, sliced green chillies, pieces of lime and 2/3rd of the fried onions, keeping 1/3rd onions aside for garnishing later. Cook, stirring frequently, until meat is nearly done and only a little gravy is left. This may take 30 minutes to an hour, depending on the cut and quality of meat. While meat is cooking, boil the water for rice with mint and coriander leaves and salt. Add rice and boil briskly, with the lid off, until 2/3rd done (2 grains felt, when rice is pressed and squashed between two fingers). Drain the water off by transferring the rice to a colander/large sieve. Run cold water over it to stop it from cooking further while resting. Leave in the colander for a few minute for the water to drain out completely. The grains should be separate. Grease a large oven proof dish or a pan with ghee. Spread 1/3rd of the rice at the base of the pan. Sprinkle 1/3rd of the saffron soaked in water/yellow colour and a few drops of kewra (screw pine flower) water/rose water on top of the rice. Now layer with 1/2 of the cooked meat. Next, cover with the second 1/3rd of the rice. Sprinkle 1/3rd of saffron/yellow colour, rose/kewra on top of rice. Now spread the remaining 1/2 of the meat on top of the rice. Finish with the last 1/3rd of the rice layer on top. Dot the rice with the remaining saffron/yellow colour, rose/kewra water on top. Sprinkle 1/3rd of the saved fried onions on top evenly. You can spread some of the fried onions on each layer of rice too, as you go along. This adds to the flavour. But you will have to fry more onions at the beginning. Dot with a little ghee and soaked saffron or a few drops of liquid jalebi (orange) colour here and there (see picture). These drops of ghee and colour will trickle down into the rice and when you serve, they will give you a nice flavour, as well as a few dark orange coloured rice grains interspersed in the rest of the white rice. This looks very nice when served. Sprinkle the cashew on top. Put it in a medium hot oven, 170-180C, on the centre shelf, for 20 minutes or so, until the rice is fully done. It can be cooked directly on the hob, on a low flame, with the lid tightly closed (Dum). This will take 20-30 minutes*. Serve hot with yoghurt, pickles and Papadoms. Traditionally, it is served with Mirchi Ka Saalan (A kind of chilli curry) or a curry gravy, sliced onions and yoghurt. If you would like a richer biryani, add another 500 gm. of lamb. Remember to increase all other ingredients required to cook the lamb, accordingly. Biryani can be pre-prepared up to step 19, cooled quickly and then kept in the fridge. Cooking time in oven will be increased by 10 minutes when cooking chilled Biryani straight from the fridge. Do not leave cooked rice lying around at room temperature, it is a health hazard. Biryani freezes reasonably well. Defrost fully. Sprinkle a little water on top, cover and heat in a microwave, or an ordinary oven at low-medium heat or in a heavy bottomed pan, on low heat for 20-30 minutes, until steaming hot. 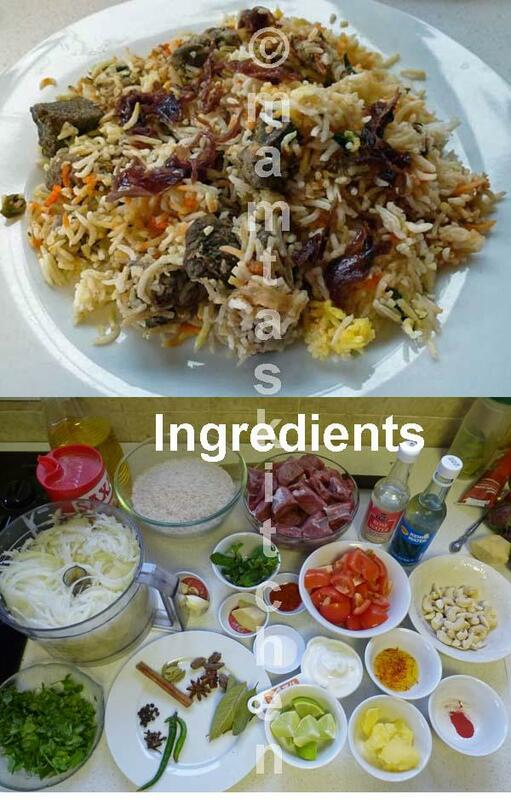 BBQ Biryani Pulao/Pilaf: Cook rice as per your recipe. Make small parcels, one parcel per person, each wrapped in aluminium foil. Place them on BBQ for a few minutes to heat, 5-10 minutes, turning over once. Serve the parcels straight from the BBQ.